Vale of Glamorgan council, Glamorgan; caused by the resignation of Conservative councillor Matthew Lloyd who had served since 2017. Well, last week was exciting, wasn’t it? Politics, but definitely not as you know it as we got a glimpse of some of the darker sides of local by-elections. Trying to keep up with the pace of politics these days is like tilting at windmills, and two major things happened after my submission deadline for last week’s previews which rather changed the course of events. The Liberal Democrat candidate in the Shadwell ward of Tower Hamlets got disendorsed by his party for anti-semitism – clearly Tower Hamlets elections today are a bit different from the Tower Hamlets election which was depicted in Call the Midwife a few weeks back – and the Labour candidate in the Totteridge and Bowerdean division of Buckinghamshire got arrested on suspicion of electoral fraud. That Labour candidate went on to win the Totteridge and Bowerdean by-election, so one suspects that the Election Court may find itself called into session within the near future – although given the slow pace of the law any disqualification might not happen quickly enough for another by-election to be held before Buckinghamshire county council disappears in April 2020. Because of these important events I was forced to tweet an addendum to last week’s column, and that addendum itself got a bit of attention – mostly along the lines of “Politics 2019” or other such despairing sentiments. This level of attention says something: clearly there is now a sort of diehard following of local elections and by-elections among the political/Twitter geek community. Even nationally-important political figures have shown a bit of interest in local by-elections. Hold that thought. The political/Twitter geek community can be useful, but of course there is an awful lot of fake news out there. Firmly on the useful side can be found accounts such as Britain Elects (of course!) and @CompletePol, together with @ElectionMapsUK and @polmapsinfoUK which do a sterling job of mapping election results. The last three of those accounts are run by students, but that doesn’t detract from their quality: their followers will see maps of which professional graphic designers would be proud, combined with puns which this column would never stoop to and an overriding sense that – to quote a man whom those students might not be old enough to remember in full flow – election night is “just a bit of fun”. Maybe this old dog could learn a few tricks from them. Over the last Christmas break some masterful work from Britain Elects pulled together a spreadsheet of all the votes cast in the May 2018 local elections. Election Maps UK aggregated Britain Elects’ figures, finding total vote shares of 40.5% for Labour, 32.0% for the Conservatives, 14.2% for the Lib Dems, 6.4% for the Greens and so on. Aggregate Council Election Results for 2018. That data is more reliable than a YouGov push poll. May government has lost more votes than Blair, Major, Cameron & Brown combined. At the time of writing this piece of fake news had over 500 retweets and over 1,000 likes. Let’s have a particular look at the sentence which I’ve emphasised. Repeat after me, THOSE DATA ARE. Everybody else seems to have given up arguing that the word “data” is plural but I’m not going to stop fighting. There are standards. And are those data more reliable than a “YouGov push poll”? Well, that’s like comparing apples with oranges; they’re both fruit, but that’s all you can say as far as similarity goes. Britain Elects’ spreadsheet and YouGov’s polling (I’m not going to repeat Bastani’s slur again) are serving different ends and Bastani shouldn’t be trying to pretend otherwise. YouGov are trying to find a sample that’s representative of the whole country, but the 2018 local election results which my genial host collated are not representative of the whole country and don’t pretend to be. If you live in the major urban areas of England, you probably had an election to go to in May 2018 and your vote will be recorded in the spreadsheet. Since the major urban areas of England skew towards Labour you’d expect Labour to be leading in aggregate across areas like that. On the other hand you probably didn’t get a chance to vote in May 2018 if you live in the English shires, or Scotland. Or Wales. 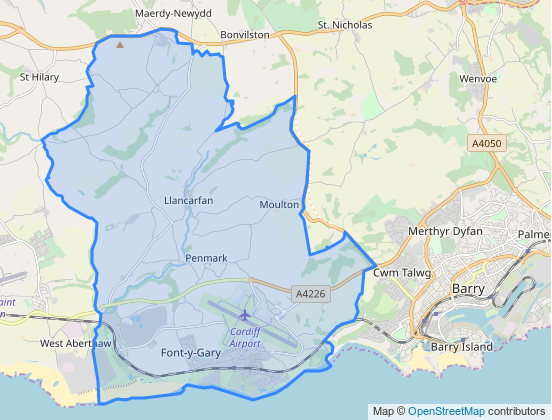 The Vale of Glamorgan is one of the more Conservative areas of Wales, and the Tories won Rhoose’ two seats fairly easily in both 2004 and 2008. Runner-up in 2008 was Plaid Cymru candidate Philip Clarke, who finished four votes ahead of the Lib Dems’ Eluned Parrott. Three years later Parrott was elected to the Welsh Assembly in bizarre circumstances, after it turned out that the Lib Dems’ lead candidate for South Wales Central held an office which disqualified him from membership of the Senedd. Things got interesting in Rhoose at the 2012 election when Philip Clarke, standing as an independent candidate, topped the poll and knocked out Tory councillor Gordon Kemp. Up until that point Kemp had been the leader of the Vale of Glamorgan council. Clarke died in a motorcycle accident in 2016, and the resulting by-election was held in the week after the EU membership referendum thus forcing the voters of Rhoose to turn up for the polls two weeks on the trot. Despite or perhaps because of this, the by-election turned in an interesting result: the winner, but with just 29% of the vote, was independent candidate Adam Riley who was campaigning to stop Vale of Glamorgan council closing Rhoose Library. Kemp, trying to get his seat back for the Conservatives, was second with 25%, Labour had 20% and independent candidate Rachel Banner was fourth with 19%. Banner had had a central role in a less-celebrated referendum of recent years; she was the spokeswoman for the No campaign in the 2011 People’s Vote on giving law-making powers to the Senedd. An impressively even vote split there, although not much of it split for the Pirate Party candidate who managed just four votes. Gordon Kemp had his revenge in the end; he defeated Adam Riley in the 2017 Vale of Glamorgan elections. The Tory slate of Kemp and new candidate Matthew Lloyd (who beat the alphabet to top the poll) had 41% of the vote, to 30% for Riley and 22% for Labour. The following month the Tories narrowly held the Vale of Glamorgan in the snap general election, with Welsh Secretary Alun Cairns being re-elected; but his seat is now most definitely a marginal constituency. As if to confirm this, Labour represent the Vale of Glamorgan seat at the Senedd in Cardiff. We have seen at Westminster level how unstable government can be, and the Vale of Glamorgan provides another example of this. The 2017 Vale elections returned the Tories as the largest party with 23 out of 47 seats; Labour, who had run the council going into the election, won 14, Plaid Cymru had four and six independent councillors held the balance of power. The Conservatives formed an administration in coalition with one of the independent councillors, with 24 seats and a majority of one. With this majority of one the Tory-led administration then proceeded to make themselves unpopular in Rhoose division, with a proposal to effectively close Llancarfan primary school by moving its pupils to a new school in Rhoose. Councillor Matthew Lloyd disagreed with this decision so much that he resigned his seat, forcing this by-election. A Conservative loss here will wipe out the administration’s majority on the council, and could lead to a change in control. Now I asked you earlier to hold the thought of local by-elections being important for nationally-important political figures. We have an excellent illustration of this in the Rhoose candidate list, because the defending Tory candidate is one of the most prominent Conservative politicians in Wales. Andrew R T Davies was the Tory candidate for Cardiff West in the 2001 general election and for Brecon and Radnorshire in 2005; since 2007 he has set in the Senedd as an AM for South Wales Central, and from 2011 until June 2018 he was the leader of the Welsh Conservatives. Instead of hiding in a shed on the family farm (just outside the division boundary in St Hilary), grumbling loudly from the backbenches and/or writing books, Davies has taken a different career path from other recent Tory ex-leaders by seeking a new electoral challenge, and fair play to him for that. Mind, the Vale’s Tory-led administration might have mixed feelings about that as Davies is reportedly campaigning against the proposed closure of Llancarfan primary school. Opposing Davies on the Labour side is John Hartland, a qualified chartered architect from Barry. On this Valentine’s Day by-election Hartland starts with a romantic advantage, in that his name will appear on the ballot paper next to a red rose. Completing a three-strong candidate list is community campaigner and independent candidate Samantha Campbell, who finished fifth here in the 2017 election; Campbell is the only candidate to give an address in the division.